Eaton Type CC 3-Pole circuit breaker is rated at 150-Amps and 240-Volts. Interrupt current rating of this circuit breaker is 10-Kilo-Amps. This 3-Phase circuit breaker features LI and thermal-magnetic type trip to ensure reliability. Circuit breaker with line and load side terminal connection, accommodates copper/aluminum wire of size 4 - 4/0-AWG. It is suitable for use with type ECC unit enclosures and loadcenters. 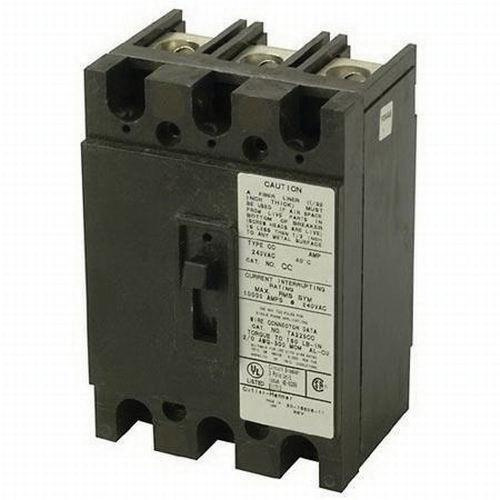 Circuit breaker withstands temperature rating of 60 deg C or 75 deg C. Circuit breaker is UL listed.